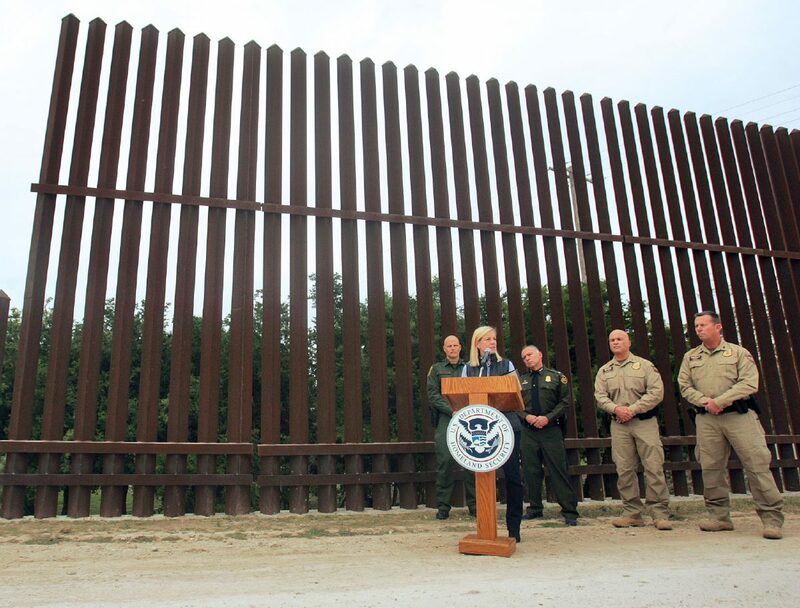 HIDALGO — Less than a week after taking office, Homeland Security Secretary Kirstjen Nielsen stood in the shadow of the levee wall here and applied a semblance of finesse to the Trump administration’s tough immigration rhetoric. Years of immigration policy failures are now rooted in the United States, which “make it almost impossible to carry out the law,” Nielsen said as her words echoed off the bollard levee wall behind her. The immigration court backlog continues to pile up, which Nielsen wants to diminish. And working with landowners to make way for the border wall can be complicated, Nielsen said. 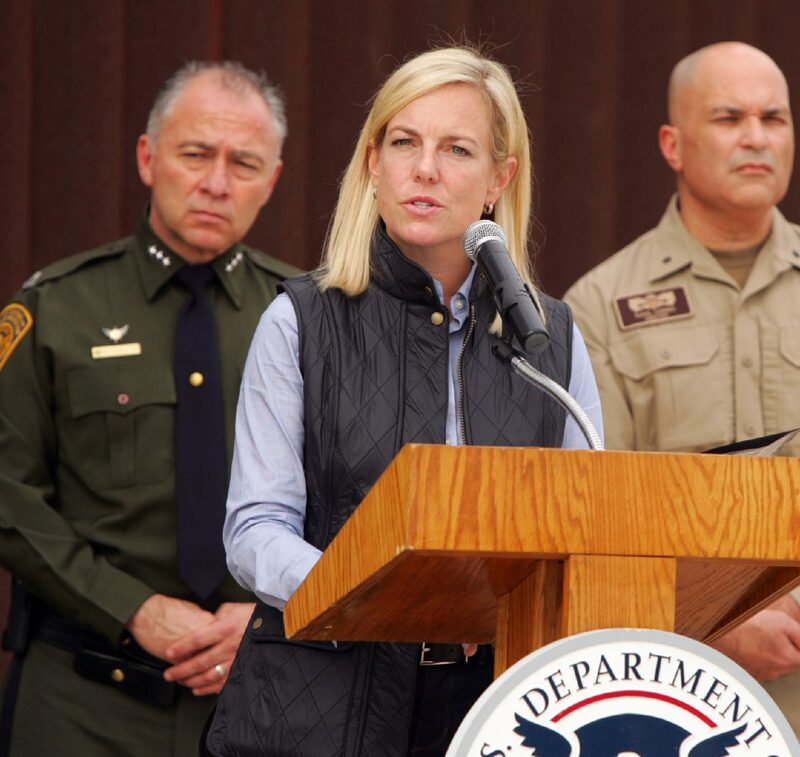 Meanwhile, Customs and Border Protection numbers show apprehensions were down this year, which Nielsen acknowledged after her tour of the border in the Rio Grande Valley on Wednesday. It was her second visit here this year, the first coming two weeks after President Donald Trump was sworn into office when she toured the region with DHS’ then-Secretary John Kelly, who is now Trump’s chief of staff. Wednesday’s visit featured a stop at Santa Ana Wildlife Refuge, where the border wall will begin, Border Patrol Sector Chief Manuel Padilla said Wednesday. Nielsen also met with agents, as well as local law enforcement at the Border Patrol station in McAllen. Border Patrol agents have apprehended fewer undocumented immigrants this year. There was a 30-percent decrease this year, CBP numbers show. Despite the lower numbers, Nielsen continues to press for more border security. From the start of the Trump Administration on Jan. 20 through the end of the fiscal year, ICE’s Enforcement and Removal Operations made 110,568 arrests, compared to 77,806 in FY 2016, an increase of 40 percent. Nielsen was forceful in the pursuit of building a border wall, but is aware of its challenges, such as people who own land on the border. Sens. John Cornyn and Ted Cruz, both Republicans, have been in favor of having a wall in some areas, but not all. Border security is not a “one-size-fits-all proposition,” Cornyn has said. But with DHS now having a full-time boss, and one with a mission to carry out her boss’s campaign promise, she hopes to ignite the wall process. When the construction will begin, however, remains unclear.